Facebook recently unveiled its new layout, and many of its users are confused and outraged. Facebook seems to feel the urge to shake up its users every time they get a bit too comfortable. In general, the changes are frivolous and annoying. The new layout features a news ticker in the upper right-hand corner of the home page. The ticker shows you every single detail, like who commented on a post or who friended whom. Screenshot by Isaac Rubin. One of the major changes is to Facebook’s news feed. 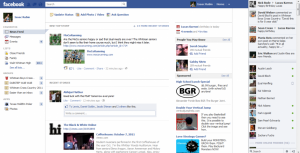 Now, the updates Facebook deems “most important” are featured at the top of the home page. While prioritization of posts is a step in the right direction, the new layout offers little advantage over the previous, simpler system, where you could choose to view top stories or recent stories. Facebook’s new features bring “stalking” to a whole new level. A news ticker in the top right corner of the screen constantly alerts users of friends’ new statuses, posts and pictures. The new layout attempts to stuff any and every inconsequential status, newly updated photo or uninteresting wall post down the hapless user’s throat. Stalking is no longer an inconspicuous act but a product that Facebook has made more accessible than ever before. Facebook also introduced the new timeline profile, a new layout that allows users to view any friend’s “Facebook lifetime.” Just type in any date and anyone can see any and all actions you did on Facebook that day, allowing anyone to see what updates you posted, say, two years ago. If this doesn’t put you on information overload, brace yourself for new notifications every time a user as much as listens to a song through Spotify, a music streaming service. Facebook’s ever-increasing transparency is not only a hazard to privacy, but a bother to users not interested in every detail of their friends’ Facebook activities. In today’s frenzied social networking landscape, Facebook and other sites are trying to bring as much information to the user as simply as possible. However, Facebook is too often tempted to make changes that look cool but only serve to complicate easy, comfortable tasks. 9.9 this happened two weeks ago, why is it only up now?